ড. বদিউল আলম মজুমদারের ওয়েবসাইট: What message did we get from Rangpur election? What message did we get from Rangpur election? The recent election of Rangpur City Corporation heralded the beginning of an important election cycle, which will end with the election for the 11th Parliament, to be held sometime at the end of 2018. Unless the government decides to hold a mid-term Parliament election, six other city corporation elections, including the mayoral election of Dhaka North, would be held in the meantime. However, the recently held Rangpur City election has special importance not only because it was the first in the cycle, but also because it was the first party-based mayoral election. Now that the Rangpur election is over, some questions come up: How was the election? What message does it convey? What influence, if any, will it have on other upcoming elections? According to all observers, the Rangpur city election was free, fair and peaceful. This is because the EC was serious and neutral. The government, specifically the bureaucracy and law enforcement agencies, made no effort to influence the results. The political parties acted responsibly. The civil society and the media also played very active roles. For example, SHUJAN: Citizens for Goood Governance and Peace Ambassadors organised “Face the Voters” meetings for the mayoral candidates and commissioner candidates of 15 wards in which thousands of people participated. In these events, comparative statements highlighting the education, profession, criminal record, income, wealth and tax-related information taken from the affidavits submitted by candidates were distributed to empower the voters to make informed choices. In these meeetings, the candiates made a written declaration to refrain from election rigging, vote buying and indulging in violence. Voters also took an oath to vote for clean candidates and candidates who renounce violence. In addition, a cultural team went to every nook and cranny of the city to create voter awareness. Social media was used to create public awareness about free, fair and peaceful election. Clearly, the credible Rangpur City election is the result of the combined efforts of all of the above stakeholders. Both the 2012 and 2017 elections of Rangpur City Corporation were credible. In both, three major political parties—Awami League, BNP and Jatiya Party—participated. The only difference between the two elections is the use of party symbols. In other words, in both elections, the same political parties contested with the same candidates and in the same location, the only difference being the use of party symbols. Because of the commonality of the parties, candidates and location, the recent election became a contest of the popularity of three party symbols. Historically, Rangpur has been the stronghold of Ershad's Jatiya Party. In the 2012 election, the combined votes of two candidates belonging to Jatiya party, Messrs Mostafizar Rahman and Abdur Rouf Manik, were 115,013, which were 8,758 more than the votes for winner Sharfuddin Ahmed's. Since Jatiya Party has continued to be the most dominant party, the recent election essentially boiled down to a contest between the Awami League's boat and the BNP's sheaf of paddy. In this contest, the number of votes for Sharfuddin Ahmed, with the boat symbol, declined from 106,255 to 62,400 votes, registering a 41 percent fall, despite the fact that the number of voters of the city has increased by 10.13 percent over the last five years. In addition, Rangpur city has about 60,000 Hindu minority voters, who traditionally vote for Awami League. In contrast, the number of votes for Kausar Zaman, with the symbol of the sheaf of paddy, increased from 21, 235 in 2012 to 35,136, showing an increase of 65 percent. Incidentally, the number of votes for Jatiya Party's candidate, Mostafizar Rahman, who won the recent election, increased by 106 percent, from 77,805 in 2012 to 160,489 in 2017. Thus, Mostafizar Rahman defeated Sharfuddin Ahmed by a whopping margin of 98,089 votes. It is to be remembered that, historically, BNP's positition in Rangpur has been weak. BNP's share of votes of Rangpur-3, which includes the city, was only 4.8 percent in the 2001 Parliamentary election. In 2008, it was a paltry 7.24 percent. The 41 percent decline in support for Sharfuddin Ahmed, despite a 10.13 percent increase in the voter roll and nearly 60,000 minority voters in Rangpur city, represents a setback of disastrous proportions for Awami League. According to Tushar Kanti Mondol, the President of the Rangpur City Awami League, Sharfuddin Ahmed recieved the vote of Awami League supporters and the religious minorites, but not the common people (Prothom Alo, December 23, 2017). This assertion, if true, carries an important message for Awami League, which has created a false tradeoff between democracy and development, and has been practicising patronage-based politics, ignoring good governance and social justice. Thus, it appears that the voters of Rangpur City sent a rude wakeup call to the ruling party. Will the leaders pay heed? 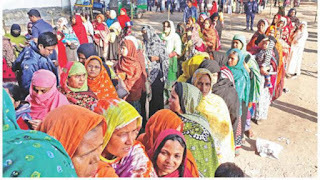 Another much-ignored message from Rangpur City election is that the number of votes for Islami Andolon Bangladesh's candidate ATM Golam Mostafa increased from 15,681 in 2012 to 24,006, registering an increase of 53 percent. The major political parties should take serious note of such a sharp rise in the support of an Islamist party. Does the free, fair and peaceful election in Rangpur provide any guarantee that the future elections, especially the national election, will be credible? One may recall that all five city corporation elections, namely Rajshahi, Khulna, Barisal, Sylhet and Gazipur, held in 2013 under the Rakibuddin Commission, were credible. Yet we had a much controversial, one-sided national election on January 5, 2014 under the same commission. Thus, Rangpur's success does not guarantee that future elections will be at the same level. It should be noted that credible elections do not depend on the EC alone. It requires the neutrality, responsible behaviour, activism and watchdog role of other stakeholders, such as the government, particularly the bureaucracy and law enforcement agencies, the civil society and the media. In fact, the neutrality of the EC is a necessary but not sufficient condition for free, fair and peaceful elections. Such elections require the good behaviour and positive contributions of all others. Thus, although the credible election of Rangpur City has created optimism, there is no certainty that it will be reflected in the future elections also. Rather, the naked politicisation—or “partisanisation”—of the bureaucracy and law enforcement agencies increases the odds against good elections, especially the next national election.